Former Chelsea manager Roberto di Matteo has been appointed the new manager of Aston Villa. The Italian succeeds Remi Garde, who was sacked in March before the club's relegation from the Premier League. 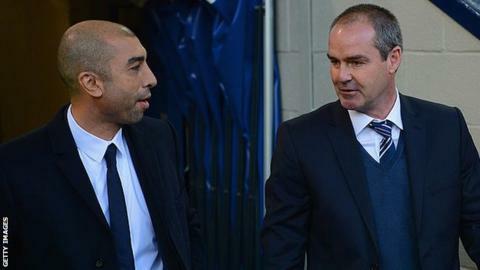 Di Matteo, who won the Champions League with Chelsea in 2012, will be assisted by former Blues team-mate Steve Clarke. Villa were also linked with ex-Manchester United boss David Moyes and new Derby County manager Nigel Pearson, but Di Matteo was always first choice. Dr Tony Xia, the Chinese businessman whose takeover of Villa is awaiting Football League and Premier League approval, is convinced Di Matteo will raise the West Midlands club's profile in the Championship. The former West Brom and Schalke boss and Clarke, 52, have been out of management since last year. The pair have never worked together in management but were Chelsea team-mates for two years. Clarke will take hands-on responsibility for Villa's group of underachieving players. The Scot has excellent contacts and recent experience in the Championship, having managed Reading until he was sacked last December. Thanks to his time at Newcastle United and Liverpool, he also has an excellent reputation as a first-team coach and worked as an assistant to Jose Mourinho at Chelsea for three years. As a head coach, Clarke, a former Scotland international, guided West Brom to their highest Premier League position of eighth in 2013. Di Matteo has not managed at Championship level since 2009-10, when he guided West Brom to an immediate return to the top flight. Since 2011, the former Italy midfielder, who played 32 times for his country, has been sacked by the Baggies and Chelsea. He left Bundesliga side Schalke in May 2015 after failing to qualify for the Champions League. The first task for Di Matteo and Clarke will be to eliminate underperforming players on long contracts, while bringing in players suited to the physical challenges of the Championship. New owner Xia has already promised extensive funds for player recruitment.